Davines OI/OIL is a refined multi-functional oil for universal use which is the perfect combination of treatment and styling in a single product that provides immediate results. 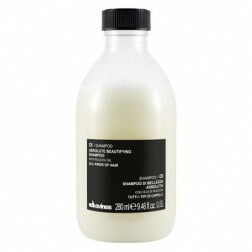 Davines OI OIL Absolute Beautifying Potion 4.56 Oz (135 ml). Multi-functional treatment oil for universal use. 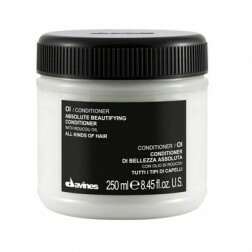 for an untangling, anti-frizz and protective effect that reduces drying times, or on dry hair for a shiny and soft finish. The special formula contains Roucou oil from the Amazon rich in restructuring, growth-stimulating and anti-oxidant properties. Designed with a focus on sustainability, starting from the formula with Roucou oil from fair trade, this new product carries on Davines’ commitment to environmental protection, a pledge that the Davines / Essential Haircare line has always promoted. The elegant and highly distinctive packaging is in fact created with low environmental impact. With the participation in the LifeGate Zero Impact project Davines reduces and offsets the carbon dioxide emissions from the manufacturing of the packaging for the whole line, by creating and protecting new forests in Italy and Madagascar. Davines OI/OIL Absolute beautifying potion enters the Essential Haircare line, combining the Renaissance-like artisan care and the Mediterranean scents with a vision inspired by the ancient oriental tradition. 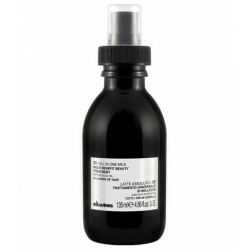 Davines OI oil is a true beauty potion born from the harmony between opposing elements that complement one another. Inspired by the feminine and masculine principles, which are the foundation of universal life, are connected to the deep meaning of the twin and opposing cosmic forces of Yin and Yang, to the binary code at the root of the modern digital revolution, and finally to the Alfa and Omega of any cosmetic need for hair.